Speaking at the event, the Mayor of Harrow praised the work of Asif Iqbal’s deaf club charity. A charity celebrated the Hindu festival of Diwali in style with 150 people joining its party. 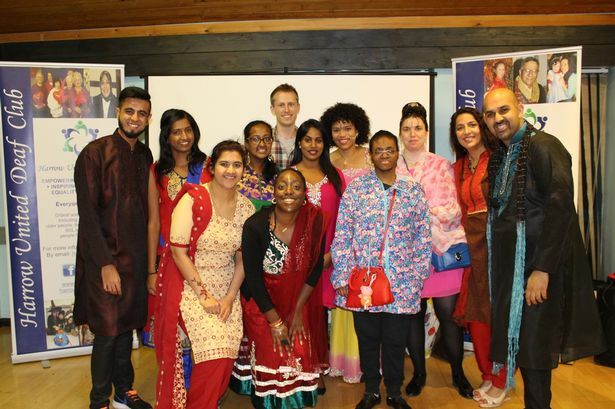 Harrow United Deaf Club (HUDC), which is based in The Bridge Day Centre in Christchurch Avenue, Wealdstone, held a vibrant gathering on Saturday as revellers came together to celebrate and learn more about both Diwali and the Muslim festival of Eid. Asif Iqbal, president of HUDC, said: “It was fantastic for people to get together in a community spirit, to gain better understanding of both cultures. “Many people said how much they enjoyed the event including socialising – making candles, having face painting, children activities and henna art. “We strive for working together with local communities and gain better understanding of each faith and cultures, promoting positive attitudes for all. HUDC work to raise awareness of the challenges facing the deaf community, and lobby for better services. Mayor of Harrow Councillor Ajay Maru said at the celebration: “The club is an inspiration for many of us locally and across the country. “The strength and passion in working together, bringing the community together as a unity, learning from each other and support for one another.